Local Checkers franchisee group Carlos Sarria is the operating partner of the franchisee group, which is under the umbrella of the Radiant Group of Companies. Radiant partners include CEO Anwar Aman, Sardar Aman, Badruddin Kheraj and Rafiq Devji. 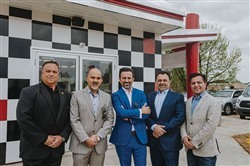 The group bought the 12 Checkers and then Rally’s locations in the Memphis market back in 2010, and Sarria joined the team to run day-to-day operations in 2014. The new Lamar Avenue location – Tristate’s first to open in four years – will feature a brand new modular building design. Interestingly, the site was previously a Checkers, but had closed down many years ago before the new management group acquired the parcel. “We have a phenomenal, small footprint that has a great return on investment,” said Sarria, who spent more than 30 years with Tristate, which also operates some Subways, Church’s Chicken restaurants and convenience stores in the region, has identified five more area locations for future growth. The buildings are constructed in four large pieces offsite in Almond Beach, Florida, and then shipped to Memphis and installed with cranes. All of the restaurant’s small wares and equipment come shrink-wrapped, so all that is needed is to connect utilities and landscape the property. Where previous Checkers restaurants featured double drive-through windows and an uncovered walk-up area in front, the new design has just one drive-up window on the traditional side, with a small covered vestibule for ordering in front and a covered outdoor patio where the second drive-through had been previously located. As with other evolutions in the business, fewer people are willing to use the secondary drive-through on the passenger side, said Checkers & Rally’s director of franchise development Bruce Kim. Kim estimates the cost of opening a Checkers location ranges from $200,000 to $1.2 million, depending on real estate and the condition of the building or plot. “The beautiful thing about us is we don’t require as much space, so where a McDonald’s or a Burger King can’t go in because they need almost a full acre, we can slide right in because we only need a third of an acre,” he said. In such a competitive industry, it is always challenging to control costs, be it food costs, affordable health care, employment, insurance and other challenges. “The Checkers’ smaller, modular footprint at a lower cost obviously reduces a lot of those challenges,” said Sarria, who estimates the new Checkers will hire about 45 to 50 new team members including management. The group’s 12 existing restaurants employ approximately 350 people. There are 875 restaurants nationwide, including more than 600 run by franchisees.